I was always sort of intrigued by those sausage-like tubes of prepared polenta. I walked past them in the grocery store countless times, picking one up, turning it over in my hands, sort of wanting to take it home but never quite sure what I’d do with it. I got super nerdy excited the first time I saw that they make one studded with quinoa, but then I realized I had even less of an idea of what I’d to with that. It was one of those weird things that I couldn’t bring myself to purchase but also couldn’t seem to ignore. So one day I said what the hell and I tossed one in my basket. 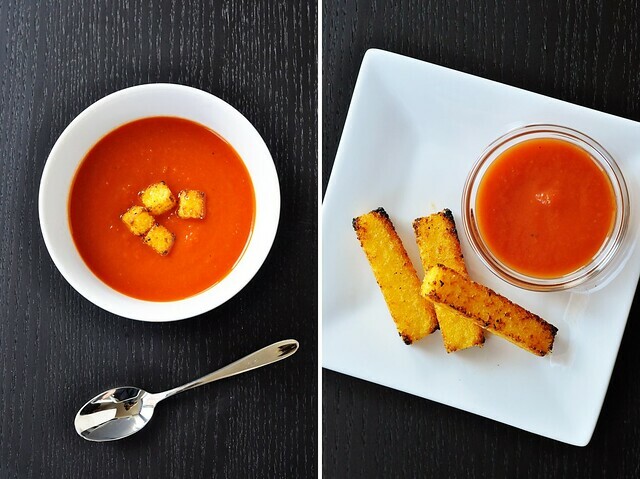 It must’ve been the universe working in my favor because, a couple days later when I needed something to add a little visual interest to my roasted garlic tomato soup, I finally thought up a tasty and simple way to utilize the object of my longing. 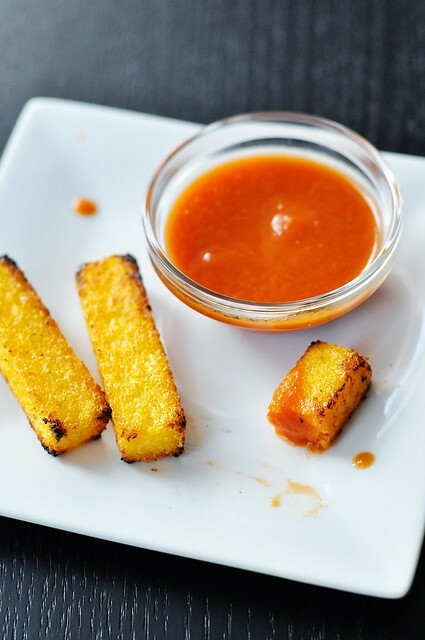 Cut into cubes and crisped up in a little oil, prepared polenta makes for mighty tasty croutons. The outside develops a light crunch and the inside goes all soft and creamy…. Which made me think, strangely, of mozzarella sticks. So I decided to cut a few sticks out of the polenta and fry those up as well. The result was something with a similar vibe to the cheese-filled snack, only a whole lot lighter. Served hot and dipped in a little marinara (or even ketchup), these guys are a fun and surprising appetizer. As for the croutons, you could drop a few into soup, like I did, or sprinkle them over the top of a salad. If you don’t snack them all away first. For Croutons: Trim the rounded ends off the polenta. Slice crosswise into 3/4″ rounds. 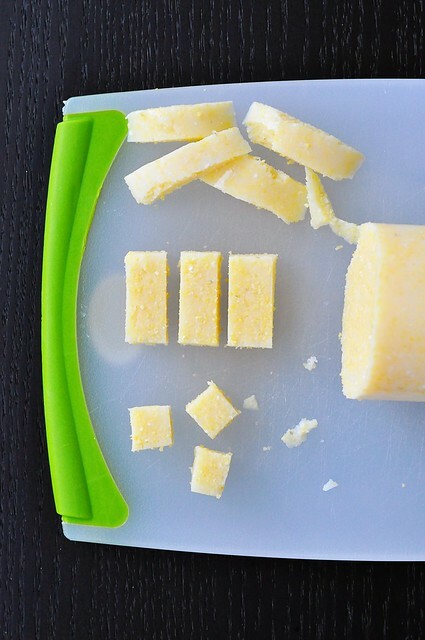 Place each round cut-side-down and trim off the rounded edges so that the piece of polenta is square. Slice into thirds. Cut the slices across into thirds again, creating nine small cubes. For Sticks: Trim the rounded ends off the polenta. 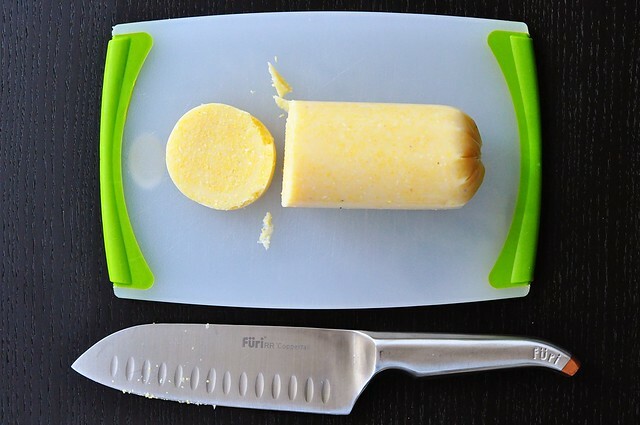 Slice the cylinder in half crosswise, making two shorter cylinders. Carefully trim the rounded edges off each cylinder so that there are four flat sides. 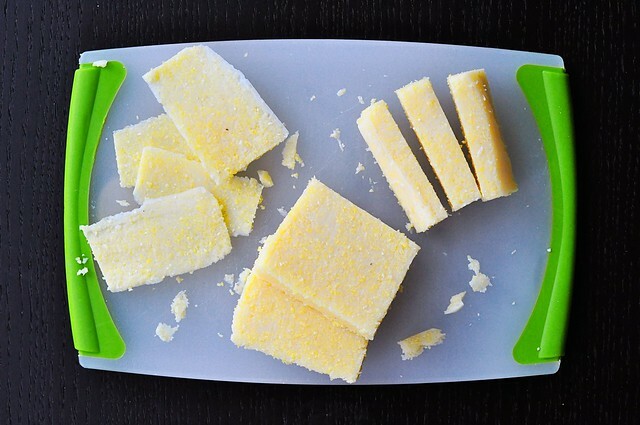 Cut the polenta lengthwise into three slabs. Slice each slab lengthwise into thirds to create sticks. Heat a small amount of oil in a skillet, enough to lightly coat the bottom, over medium-high heat. Add the cut polenta to the oil. It will splatter considerably, so cover immediately with a splatter guard or tent with foil. Once browned on the first side, use a thin spatula to turn and continue to fry until all sides are browned and crisp. Use care when turing because the polenta becomes soft when hot. 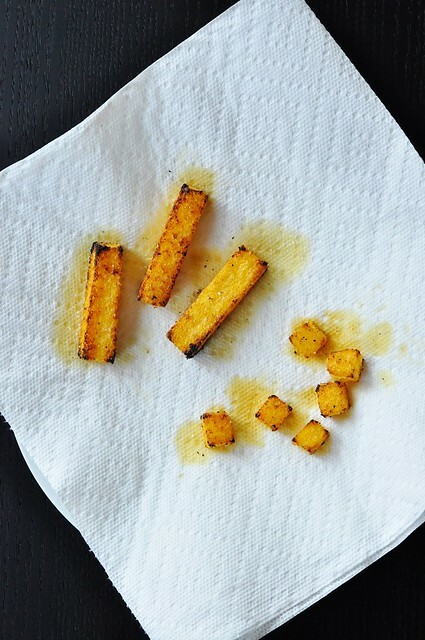 Transfer crisped polenta pieces to a paper towel lined plate to drain. While hot, sprinkle with kosher salt and, if using, dried herbs or spices of choice. Serve promptly.